Yesterday I invited a couple of friends round for a little get together at my place. 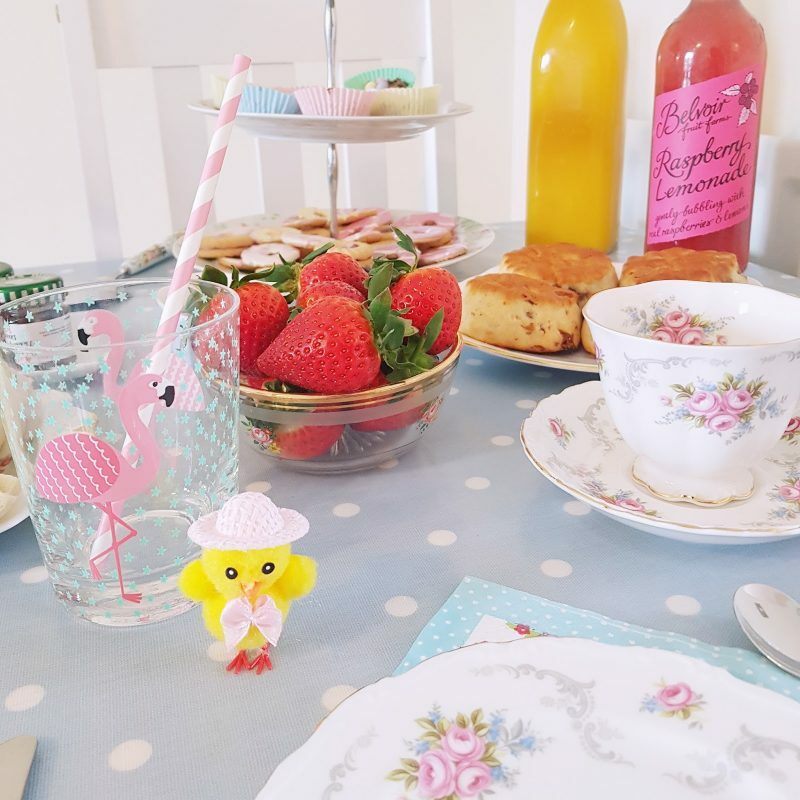 Gavin was out for the day so I had planned a girlie day in and a surprise Easter themed craft-ernoon tea party! My friend is pregnant so it was kind of a mini baby shower for her as well as a nice little catch up! 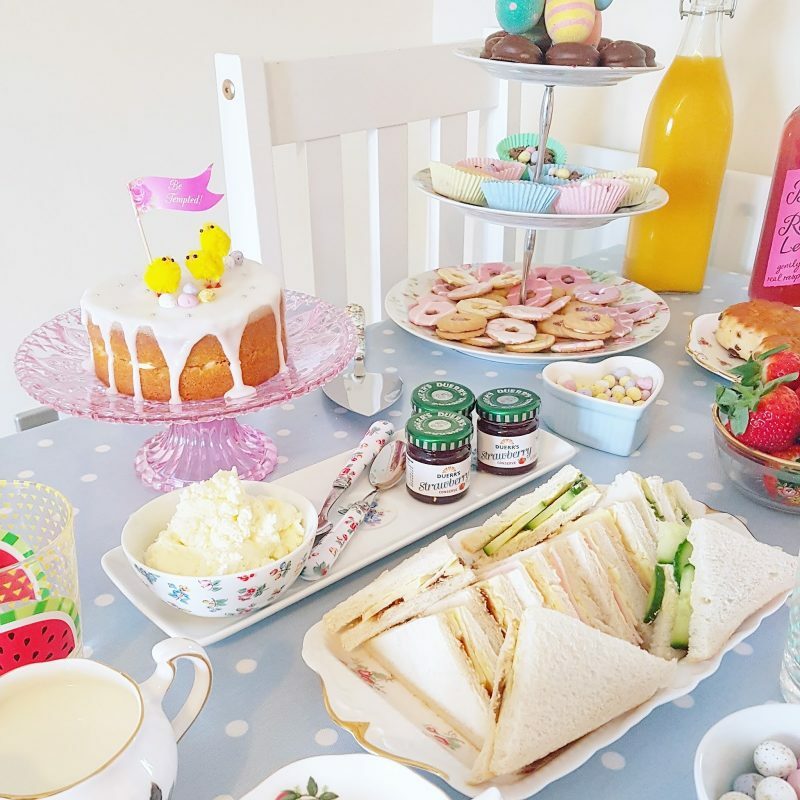 I had a little Easter tea party at my parents house for family a few years ago and I really enjoyed putting it all together, so I decided to do a similar thing again this time around. It was a little bit tougher to prepare this time as I didn’t have my Mum to help me (and my dining room table is quite small!) but as there was only three of us it was just about manageable! 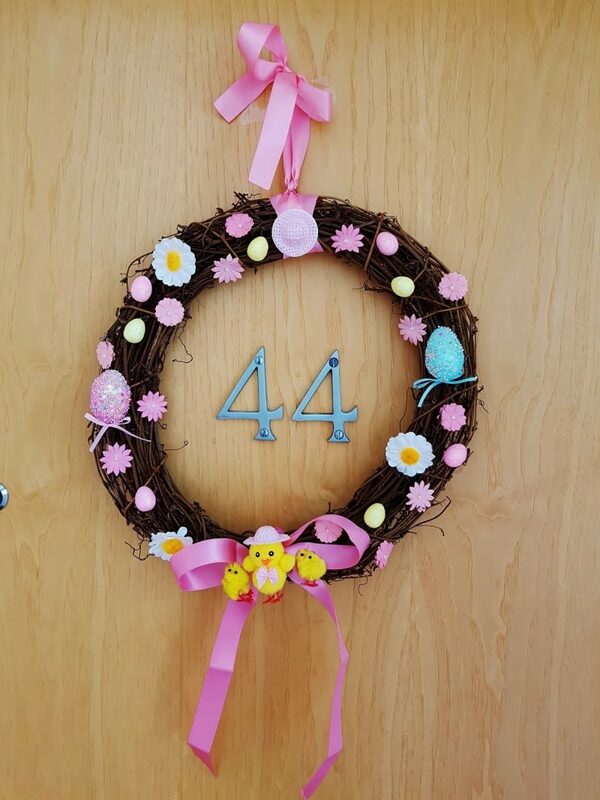 I’ve also shared how to make your own Easter door wreath in this blog post too! To prepare I gave the whole flat a super-duper spring clean from top to bottom, and then put up some pretty fabric floral bunting around the dining table and some cute tissue paper pom-poms (bought from The Range for only £1.49!). Plus, I think my vintage plate wall looks perfect in the background too! 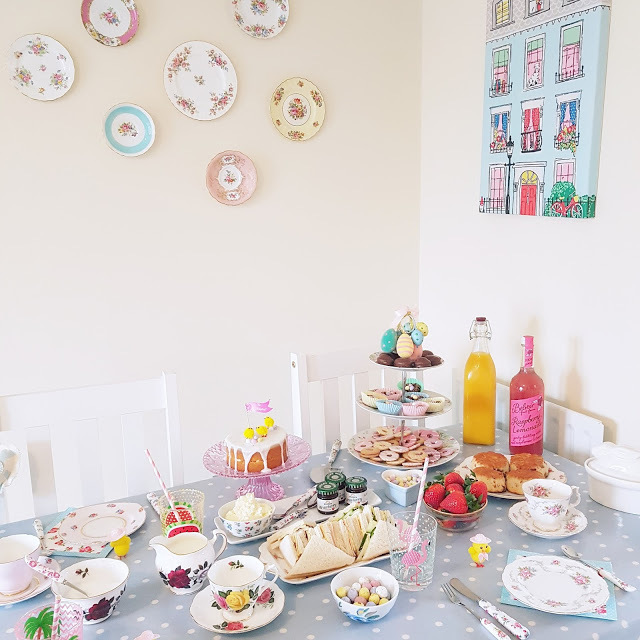 I set the table using some of my favourite vintage tea cups (I have a huge collection!) along with my cute little cutlery sets (Cath Kidston and Katie Alice) and pretty cake plates that I’ve collected over the years. I also bought some floral napkins and pink striped paper straws (from Home Bargains) as they were too pretty to resist! 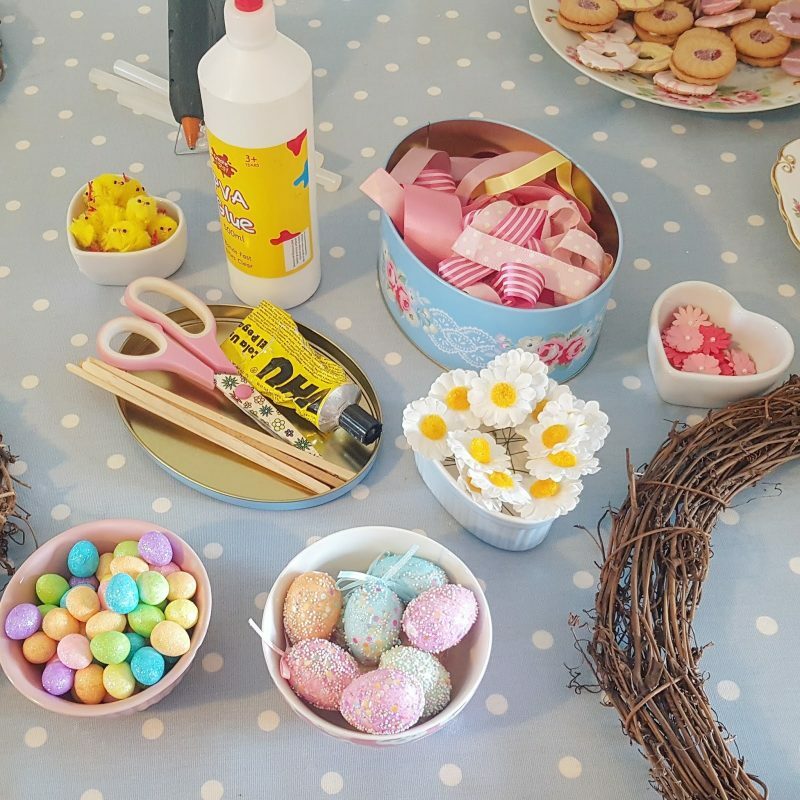 As it was Easter themed I also put some bowls of mini eggs on the table and placed little furry chicks at each table place alongside a full sized Easter egg each. I did a big food shop the afternoon before (luckily I had the day off work) and bought all the essentials: scones, cake, biscuits/treats, jam, cream, strawberries, drinks, bread and different sandwich fillings! 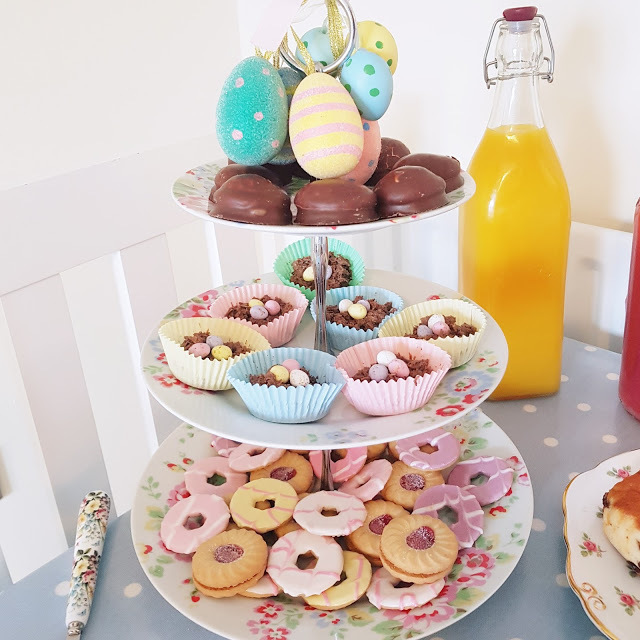 I spread the little treats (Tunnocks tea cakes, Party Rings, jammy biscuits, and ‘Easter nests’) out on my Cath Kidstonthree tier cake stand and hung a few Easter egg decorations from the top. I made the Easter nests the night before (in case you’re wondering, you literally crush up some shredded wheat, cover it in melted chocolate and top with mini eggs) and then put them in little pastel coloured cake cases. I didn’t have time to do any proper baking so instead of making a cake, I bought a lovely little lemon drizzle cake which I then decorated a bit myself. It was very simple, I simply topped the plain sponge top with white glacé icing which I made with lemon juice to give it a tangy flavour. I love how the icing looks drizzled down the sides! 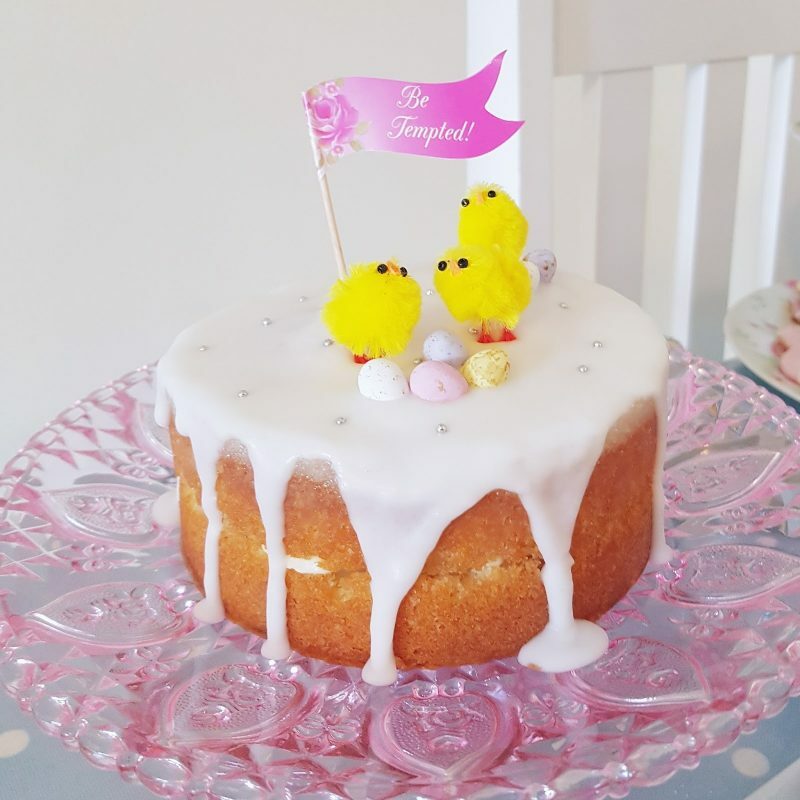 I then decorated it using a few little yellow chicks (which I bought in Poundland) and some mini eggs. It looks kinda homemade, but without the effort! And I think it looks just lovely presented on the pink glass cake stand with the floral Katie Alice cake knife. 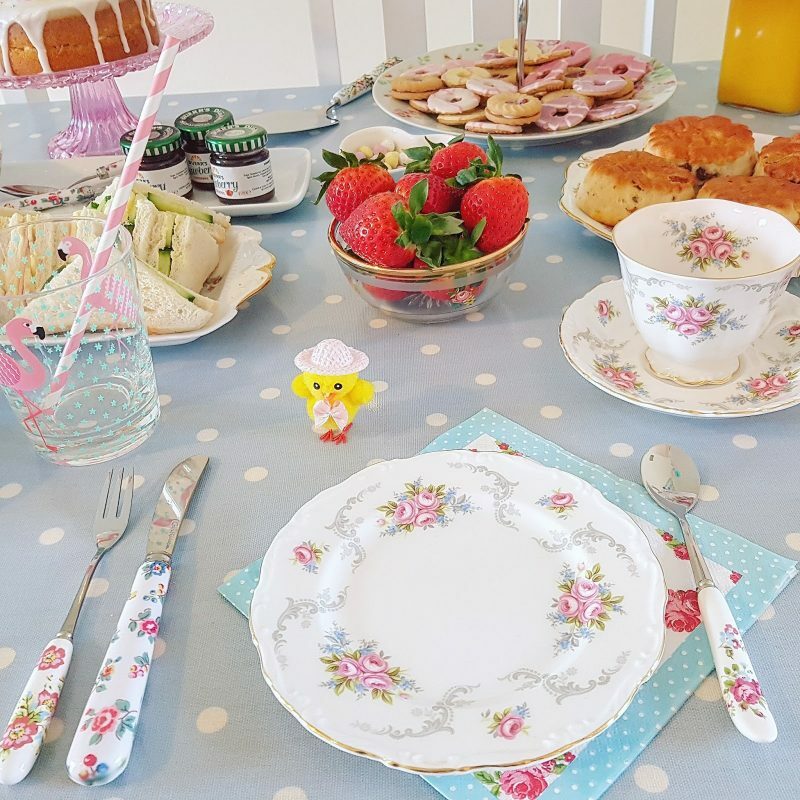 The morning of tea party was pretty hectic as I didn’t want to prepare everything too early because I wanted it all to be as fresh as possible. I made the sandwiches just before they arrived and I only did three fillings; cheese and ham, cucumber, and cheese and pickle. I then presented the little sandwiches cut up into triangles on a vintage floral sandwich plate. Cute! I bought some fresh scones from M&S as well as whipping cream and some individual jars of strawberry jam (only 25p each in Home Bargains!). I added some icing sugar to the cream and whipped it up as thick as I could so we could use it on the scones and strawberries. 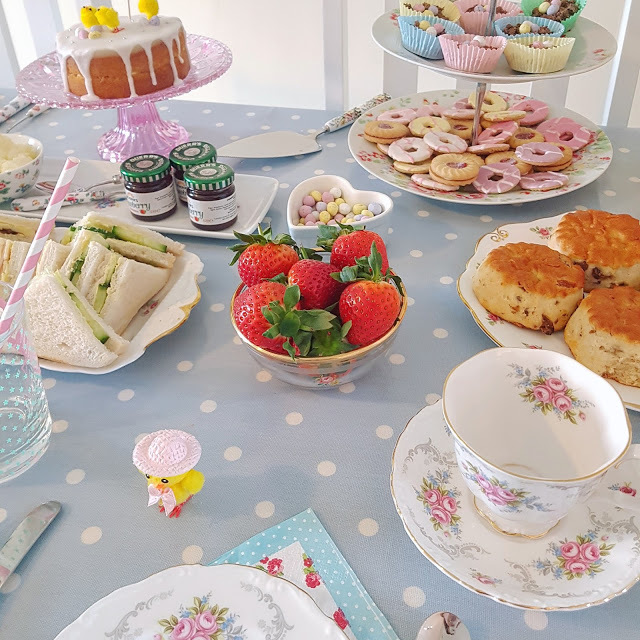 I used a Cath Kidston platter with a small bowl to present the cream and jam jars so that everyone could help themselves at the table. For drinks I served tea in my Cath Kidston teapot (that I’ve had for years but never used before), and put the sugar and milk in a floral vintage jug and bowl set. I also put some chilled fresh orange juice into a large glass Kilner bottle and had a bottle of raspberry lemonade on the table too. The cute tropical patterned glasses are from Sass and Belle and I absolutely love them, but I only get them out for ‘special occasions’! Now, you might be wondering where the craft-ernoon tea bit comes in! Well I wanted this tea party to be a little bit special and different so I planned a little surprise activity. 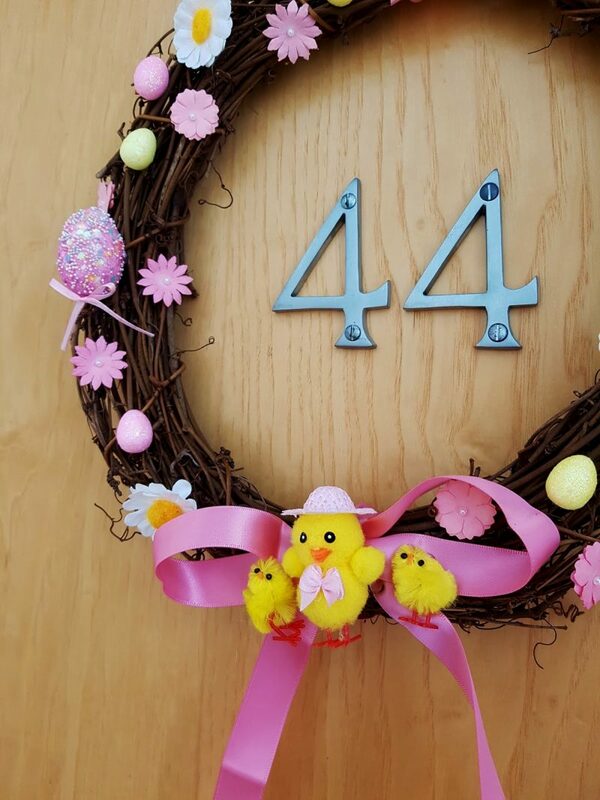 We made Easter door wreaths decorated with lots of colourful little Easter decorations! I was a bit worried that they might think I was a bit weird planning this, but my friends were so thrilled and excited to get creative! Want to know how to make your own Easter door wreath? 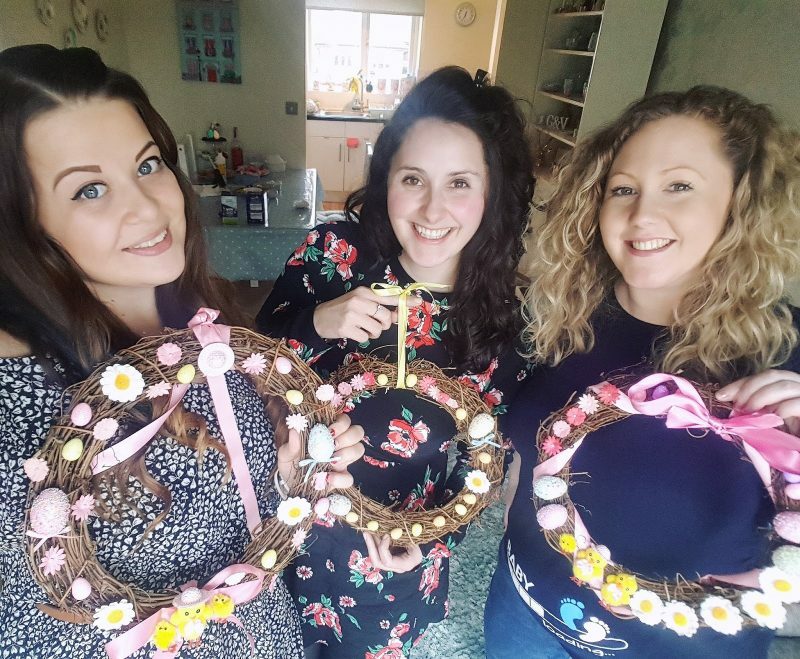 I bought the plain wicker wreaths from Hobby Craft for £3 each, and then just bought lots of mini glitter polystyrene eggs and flowers so we could decorate them using a glue gun and plenty of ribbon. I also stuck some of the little chicks on mine! The glue gun was better than PVA glue as it dried instantly and ensures things are properly stuck! You can decorate your wreath however you like, part of the fun is that everyone’s wreath will end up looking different! It was such a lovely afternoon and so nice to do something a little bit different by getting creative! 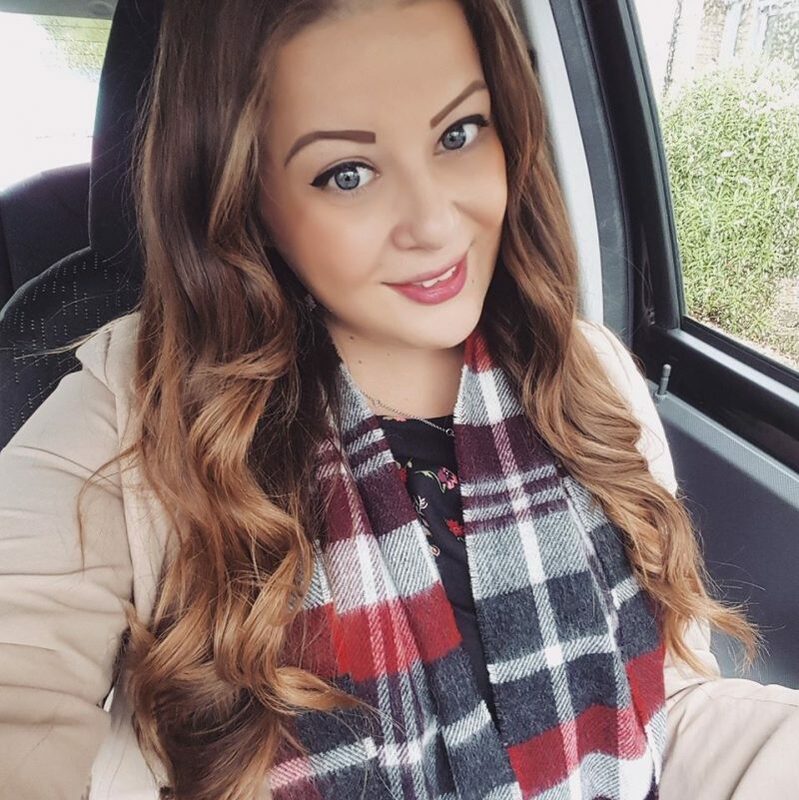 Sometimes it’s nice to take a bit of time to enjoy spending time with friends over something rather than just going out for drinks or eating in a restaurant. It was a great opportunity for us to catch up properly as well as have a fun afternoon treating ourselves to cake and doing some crafts! Aww this sounds lovely! Such a pretty afternoon tea!